In 2006, Rose Community Foundation joined and began funding an education and organizing coalition in support of in-state tuition for undocumented students to attend state colleges and universities. For seven years, we have worked with an education organizing coalition including The Bell Policy Center, the Center for Immigration Reform Coalition, Colorado Latino Leadership, Advocacy & Research Organization (CLLARO), Padres Unidos, Stand for Children and Together Colorado in support of the Higher Education Access Alliance. This alliance has been the steady voice of grassroots advocacy for support of in-state tuition assistance. 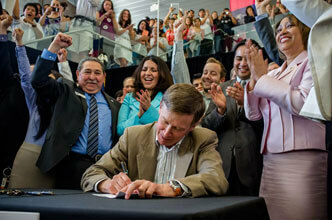 Near the close of the 2013 Colorado legislative session, Governor John Hickenlooper signed SB13-33, the tuition equity bill, into law. Getting to this victory wasn’t always a smooth path and there were a number of setbacks and bumps along the road. However, the coalition stayed the course. This is yet another example of the Foundation demonstrating leadership by taking the long view in solving problems: we recognized a compelling community challenge, supported coalitions and made some calculated bets with our resources. In recognition of this major victory, Rose Community Foundation made a contribution to the Invest in the DREAM Fund at Together Colorado, which will help students who are eligible to file for “deferred action for childhood arrivals” (DACA) status. The application costs each student $465. DACA gives students the federal paperwork necessary to be eligible for some scholarships and employment opportunities after college. Congratulations to everyone involved in achieving this great success!